This pleasant pop/rock outfit formed in Dallas in 1964 and proceeded to enjoy a prolific recording output until they disbanded in 1970. Mike Rabon, Norman Ezell and John Durrill formed a successful song-writing trio and most of the band's songs were self-penned. Western Union, produced by Dale Hawkins, captures them at their best and includes their three main hits:- I See The Light, Westem Union and Sound Of Love, along with covers of Steve Winwood's Gimme Some Lovin, Screaming Jay Hawkins, I Put A Spell On You and Roger Miller's Husbands And Wives. 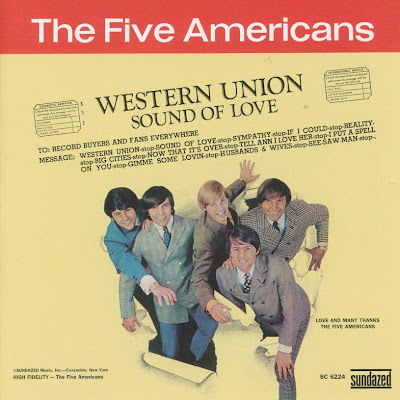 Westem Union and Sound Of Love both received a fair degree of airplay in the U.K. where the former was covered by The Searchers, but neither charted. Group members Jim Grant, John Durnill and Jimmy Wright, along with Bobby Rambo and Jim Glaves (from a group called The Crowd) were the backing musicians on the album Elastic Event (Abnak ABST-2070) 1967 by the Dallas pop/rock duo Jon and Robin. The Five Americans drummer went on to marry Javonne Braga aka "Robin" in the '70s after Jon and Robin and The Five Americans had broken up. ~ (Vernon Joynson / Max Waller / Tom Truszkowski / Stephane Rebeschini.